Today I decided to have a 'Day of Minna', which means I spend a day by myself doing things I want to do. Technically every day is a day of Minna though, I suppose. So I went to the NGV and ACCA, lay in the sun at the Botanical Gardens, then went to Savers. I enjoyed myself, and was glad to get back to the 'real world', living in the suburbs means that on holidays I rarely leave my 'local area', most of the time I have no reason to, other than for my sanity. Which is, you know, occasionally important. 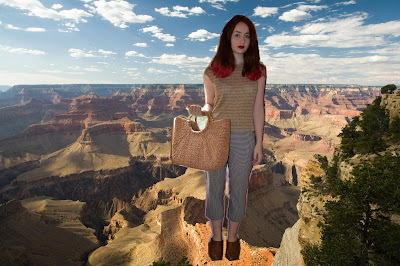 Above is me standing in front of the Grand Canyon wearing the outfit I wore today, and also a too good to be true record that I found. Mrs. Mills 'Especially For You'. Look at it in all it's glory, the flowers, the font, MRS.MILLS. Truth be told I haven't listened to it yet because I am slightly scared, I think rightfully so.